SUP: The passionate and adventurous crew from “Stand Up Projects” are back on their boards and “Standing Up” to save lives for MissionShip. The members of Stand Up Projects group during their circumnavigation of Phuket in 2012. The MissionShip the boarders will be paddling for. The route to be taken by the eight boarders. The crew from Stand Up Projects are not new to doing crazy adventurous things to bring awareness and needed funds to community projects. 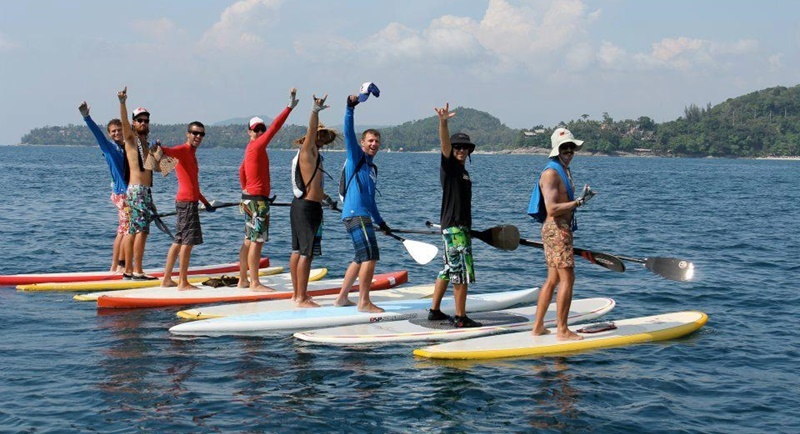 They were the first to circumnavigate Phuket on stand up paddle boards back in 2012, taking them four days to complete the 130 kilometre journey. They were able to raise what was needed to build and see the completion of the Mike Mathews Learning centre, a school for underprivileged Burmese kids in Phuket Town. 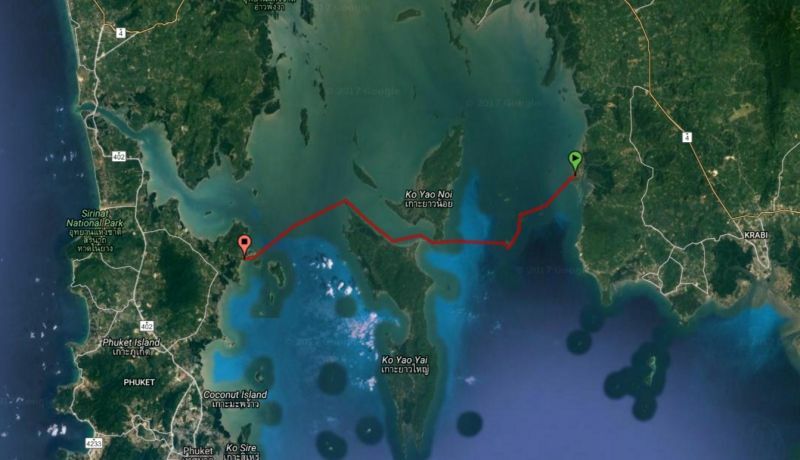 Now eight of them plan to stand up paddle on Monday (Mar 13) and Tuesday (Mar 14) from the Thai province of Krabi across the open sea landing on Phuket. The crew are aiming to do the paddle in two days, sleeping one night on a remote island beach. With the generous support so far of local businesses Phuket.Net, E-media Asia and Skyla’s Surf & SUP Club, the crew will leave on a bus with all their boards and equipment on Sunday (Mar 12) to Krabi. Early Monday morning they will set off paddling West with Phuket in their sights. They have mapped a couple of potential islands to camp on the first night but it will depend on weather and wind direction to which island they end up camping on. Luke Remmers, a longtime resident of Phuket and one of the men who circumnavigated Phuket in 2012, said one of the main challenges they could face is a change in wind direction during each day which will chop up the water, creating waves making it bumpy as well as blowing against them rather than behind them which makes it much more difficult to paddle. Stand Up Projects was created for the main purpose of supporting sustainable community projects that were already started by individuals but needed the support to raise awareness and needed funds, and Tim Campbell, Co-founder of Stand Up Projects, was introduced to a remarkable man who has the vision of MissionShip. MissionShip is a charity project which aims to build a medical boat that will provide health and medical services to remote island communities. MissionShip aligns its self with UNICEF which is actively trying to reduce the rate of sick people who die every minute from treatable diseases. As thousands of people suffer and die from preventable diseases, the heart of one man, Captain Patrick Vickers, has set out to fulfill a vision of building a medical boat that will sail around and provide medical services to remote island communities around the globe. Alex Lotz, owner of Phuket.Net said, "Phuket.Net is delighted to support such a worthy cause that will help get vital vaccines and medicine to people of remote island communities." 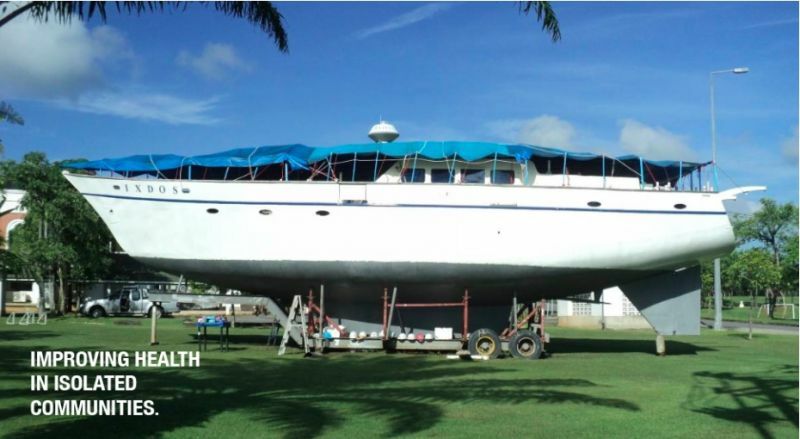 The boat, named “Ixdos”, has been living on the grounds of the British International School in Phuket. The school has been very supportive in allowing Patrick to have a place to work on the boat as donations come in. The students have had opportunities to be hands on with this project as well as experiencing what goes into a project of this size. The boat is nearly finished and needs $60,000US (B2 million) for the remaining items of sails, rigging & boat electronics. Once raised the boat will then be sea ready and on its way to saving lives. The crew from Stand Up Projects are aiming to raise 5,000 pounds (B200,000) for five sails from their paddle this week and they are asking for all of you to spare just a little and help contribute to saving lives. You can find all the information about the paddle on Stand Up Projects Facebook page. All the information on the boat you can find at www.missionship.com where you can contact Patrick personally and learn more. Donations can be made directly atwww.GoGetFunding.com/SUP. It’s wonderful to see how everyday people can join together to make a difference.